Despite glasnost and the unexpected thaw in East-West relations, American foreign policy continues to evolve within the shadow of a nuclear strategy profoundly shaped by the writings of Bernard Brodie. Renowned as "the American Clausewitz," Bernard Brodie (1910-1978) was one of the premier architects and proponents of the strategy of deterrence and one of the most articulate voices in the debate over the role of nuclear weapons. His writings reflect his struggle with the dramatic shift in defense strategy brought about by "the bomb" and his unswerving belief that nuclear weapons had made total war obsolete. Steiner maps out Brodie's strategic thought as it developed from the best-selling Seapower in the Machine Age (1941) and The Absolute Weapon: Atomic Power and World Order (1946) through Strategy and the Missile Age (1959) and War and Politics (1973), and in his articles, lectures, reports, and speeches. He analyzes how Brodie and other strategists tried to cope with the juggernaut of change in nuclear weapons systems, Soviet expansionist aims, the wars in Korea and Vietnam, the Cuban Missile Crisis, and a host of other events and issues. 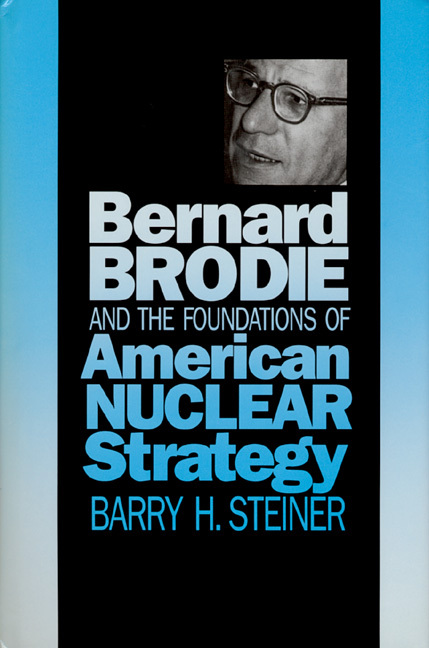 Steiner shows that Brodie was instrumental in shaping American national strategy for the last half-century. Barry H. Steiner is professor of political science at California State University, Long Beach, and is the author of Arms Races, Diplomacy, and Recurring Behavior.